Christie's Review of the Year 1968/1969 ANON. 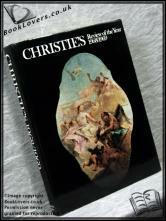 Christie's Review of the Year 1968/1969 - ANON. Newman Neame, 1969, Hardback in Dust Wrapper. Size: 9¾" x 7½". Blue boards with Gilt titling to the Spine & Upper Board. 368 pages.